Bread pudding is a dessert or snack item made out of stale bread mixed with milk, eggs, spices and dried fruits. A popular dish in several European countries like France, Ireland, Great Britain, Belgium as well as Latin and South American countries such as Puerto Rico, Mexico, and Argentina. There is no rule in what ingredients to use in this dish but definitely the main stays are left over breads, milk and eggs. Bread puddings date back many centuries and this started as most people could not afford to waste food. Puddings are not the only product of stale bread reuse others such as thickeners and edible serving containers are also a by-product. Early versions of puddings are usually made of milk, stale bread and some sort of sweetener such as honey, sugar or fruits and it was a common dish during the Roman period. But it’s not just the Romans who enjoyed this dish that is why Egyptians have “Om Ali”, the Middle Easterns have “Eish es Serny” and the Indians have “Shahi Tukra”. Puddings are served on its own or with a sauce the common ones are whiskey sauce, rum sauce and caramel sauce but in this instance I will be serving it with some butter the pudding is already sweet for me and a melted butter is a good way to balance that flavour out. Break bread into small pieces then place on a baking pan together with the raisins. Drizzle over the melted butter over bread. Mix together eggs, evaporated milk, water, brown sugar, ground cinnamon and vanilla. Pour mixture over bread making sure all bread pieces are soaked with the liquid. Bake in a 180C preheated oven for 45 minutes. Serve while hot with butter on top. Big cup of tea is perfect for this delicious looking bread pudding. This sounds absolutely wonderful.. lovely comfort food as well. I’ve often got bits of bread ends left over and now I can put them to good use! what a delicious dish to come from stale bread! My mom makes one with figs at christmas it is so good! Great recipe! I love bread pudding but have never made one at home. Very inspired to do so now after reading your post. 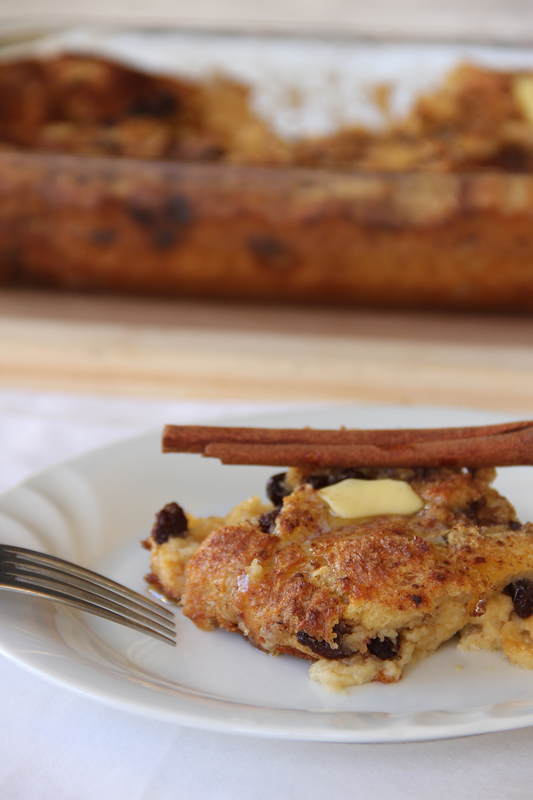 I love bread pudding, it is the perfect comfort food and your picture is making me hungry! Now you have me needing some bread pudding! Yum!!! Looks delicious! Bread pudding is one of my faves!